Today I'm doing a “5 Things” post... like a little wine tasting... snippets of a few different things that you'll hopefully fine helpful and relatable! We bought this air purifier on Amazon Prime day, and I’m stoked about how well it works. It removes pollen, dust, odor, and mold from the air, and that sounded like a pretty good idea to me. Irritants like those can keep our bodies busy fighting off excess environmental factors, leaving less cellular bandwidth for our body to protect/heal/function at top notch. We obviously have to use a little blind-faith that it's actually removing all of those things, but after waking up feeling like we were breathing light clear mountain air (in the Phoenix desert), we were pretty convinced something good was happening! Besides that, it also stopped Stephen (my husband) from snoring....kinda a huge deal. His snoring has always been due to inflammation in his nose, (which is common for so many people), so cleaning up the air allows for the nasal passages to clear up and hugely increase sleep quality. 100% recommend! This week I packed up a bunch of old clothes, a practice I try to do a couple times a year, and one I encourage clients to do as well. 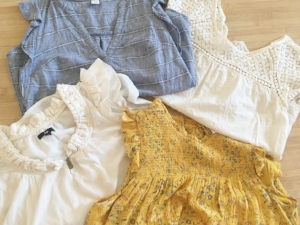 Sometimes we hold onto clothes for way longer than we need to, and letting go of them can be so helpful and healing. Clothes can feel triggering for a few reasons: if our body is changing in size or form (because it’s normal and natural for it to shift throughout life! ), if we just don't feel pretty/confident in certain clothes anymore, or if a piece of clothing has a painful memory tied to it. In any of these situations, they can sit in our closet and be a source of tension that we don’t even realize we're living with. It can be helpful to remember that as you allow yourself to move from a past version of yourself or your wardrobe, you're moving INTO your most holy form, the one that is you TODAY. It can be so freeing to pack them up, pass them along, and make room for the new. You don’t have to wait around until it fits, or keep it because it was expensive, or hope some day you’ll like it. So here’s your permission slip to let it go, give it away, and wear what makes you feel good. Unfortunately this photo does not look delicious..but as stated previously, I'm sure no food photographer, so that’s as good as it gets and you'll have to take my word for it that these are SO good! -sprinkle with sea salt and nutritional yeast for a cheesy flavor! For years I didn’t eat gluten because it's not particularly a great match for a compromised digestive system. If you live with celiac or another autoimmune disease, reintroduction isn't a goal for you, but if gluten has just caused irritating symptoms in the past, it can likely be reintroduced in moderation once your gut heals. I don’t recommend gluten as a dietary staple, because the gluten in America is processed quite heavily. BUT there are some wonderful whole grains that are glutenous and can be a part of a healthy diet (like millet, quinoa, and buckwheat). The more plant variety you introduce into your diet, the greater your nutrient intake becomes, so working to tolerate whole grains of all types can be so helpful for your health (and they're delicious). After healing the gut, a helpful first step as you re-introduce glutenous grains is to start with the sprouted versions. The sprouting process makes them much easier for the body to break down, so you're less likely to have a reaction and will be able to absorb the nutrients more readily. 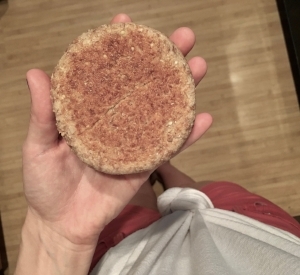 So if you've been wanting to introduce more whole grains into your diet after being completely gluten-free for a while, start with sprouted whole grains or products such as Ezekiel Bread. I LOVE their English muffins. Being a constant learner keeps our brain healthy and our heart nourished, because inspiration is a wellspring for creativity. Lately I’ve been loving the “Sounds Good” podcast by Brandon Harvey - "hosting hopeful conversations with optimists and world-changers about the unique experiences that drive them to use their influence for good." 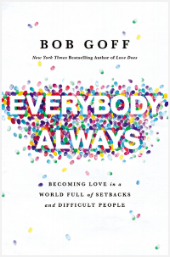 Stephen and I are reading Bob Goff’s “Everybody Always” book, and it’s for sure on my top 5 favorite books I’ve ever read. He’s hilarious and full of so much wisdom. What have you been listening to, reading, and loving??? Tell me in the comments!